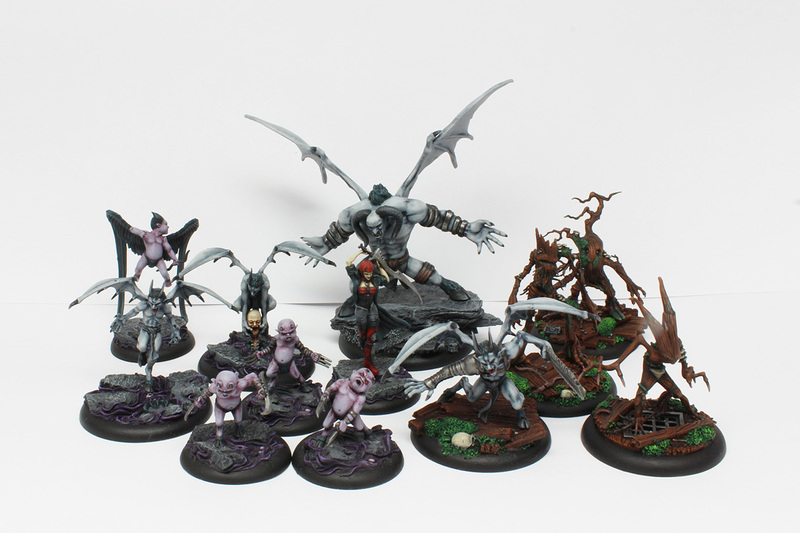 In my last post I presented the miniatures I painted for my Malifaux Neverborn band – Nephilims. Mature one and two younger. These three miniatures were planned to complete the base of my Neverborn faction. It was kind of the race against the clock for me. I bought the first Malifaux box set in August (Lilith – Mother of Monsters) and I wanted to to paint enough miniatures to play tutorial game before 21st October (my departure date). At first I thought it’s enough time to paint the minis from the box and even few more. So, I added Waldgeists and Nephilims to my painting schedule. It all seemed to be manageable and possible to combine with my other painting projects at the same time. However, as usual, everything got little messed up – I was late with everything. I had plans to play two tutorial games before my departure. 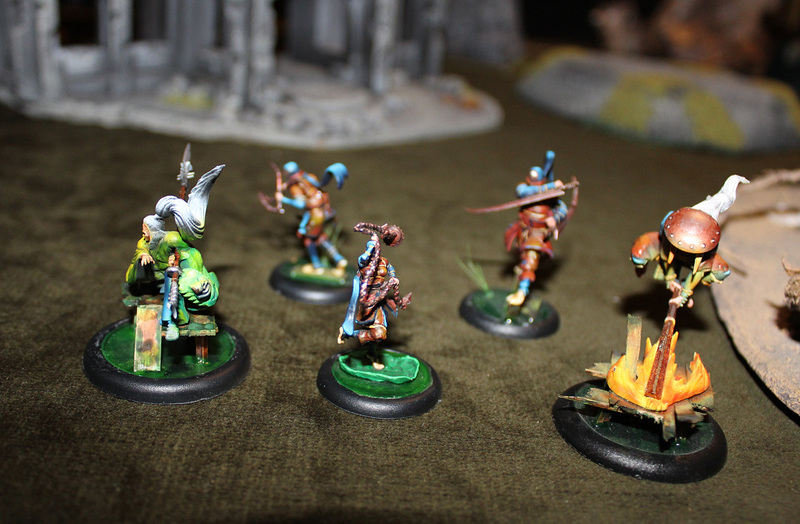 First, Infinity and second – Malifaux. Due to failure of my time table, I was forced to abandon my plans about Infinity. No way I could finish miniatures to play the game – I was able to paint only 4 of them – still need at least 5 to play proper game. No worries – I’ll finish them while I’ll be in Asia. But the game was off. And as soon I realised that there will be no way, that I could not handle two projects at the same time – I concentrated my efforts on Malifaux models. I arranged the tutorial game with my friend Sławek for beginning of October and I rushed to my painting station to finish all my planned models. My Malifaux Neverborn band. Lilith The Mother of Monsters. I supposed to paint them all. Unfortunately I was late with Nephilims. I managed to put the base colours and paint details, but they were still to be toned up. At least they were good enough to put them on tabletop. Later this week I finished them and started to pretend this situation never happened;). In this post you can see their photos. Beside Nephilims, everything else was fully painted and ready. I was about to face Ten Thunders. I did not get any clue what to expect. I did not know any rules and stats. Well, I had no intentions to even bother to check it out. Fun – it was my only goal. Fun and learn – this is what I wanted. Mature Nelphilim and two young ones. They gave me, along with the leader – Barbaros, nice mono themed band to play. I love such compositions – they look the best on tabletop. Sometimes they do not act as good as they look during the game, but it’s no the point. I need a lesson, I need to give Malifaux the try. So, Barbaros and his band will receive this lesson. Bring it on! Barbaros and Nephilims are ready! My opponent, Sławek took – Ototo (as leader), Yamaziko and three Torakage. As a total newbie, I had no idea who exactly I’m dealing with, but honestly my plan first of all to learn the game schematics – not to win at all cost. Ten Thunders, Ototo and his band. We played Squatter’s Right strategy. I used Bodyguard and Murder Protege schemes and Sławek chose – Bodyguard and Distract schemes. Schemes and strategy we have drawn. Tabletop set up. My Neverborn started on left corner, and Ten Thunders on the right. Markers were in the middle. Generally, the game was all about markers. Both of us quickly rushed to take over the markers. Unfortunately for me Ten Thunders were faster and I was forced to fight for them. I am absolute noob – and I was not aware that Distract scheme has such powerful potential. Basicly, my models couldn’t do anything – Ten Thunders were distracting all the time and I all my Nephilims could only spend all their available actions to get rid off the distraction effect. But it costs 2 Action points! Damn, no AP left to engage in combat or interact with markers. And Ten Thunders had one model more then me – so they could distract me and still one model left to do other actions than distract. I don’t remember the final score. It was something like 8-3 to Ten Thunders, but it could be more. I did not care about the win or lost – I wanted to learn the rules and so I did. Sławek I owe you a beer or two:) Before the game when I was reading the rulebook or studying characters card – I was only thinking I understand the rules. Well, not exactly – in my understanding the rulebook is not written properly to easily comprehend the knowledge. I thought I get the idea, but during the gameplay it all started to be blurry. Sławek is patient teacher and he explained me all my doubts. Right now – when I read the abilities on stat card I understand all of it or at least 90% of it. Soon, I’ll become Malifaux champion! (well, we will see about that;). What can I say? Malifaux is great! Generally I try not to judge game by its rules and concentrate on miniatures. If models are appealing to me, then I buy some to paint and eventually I want to give the game a try. 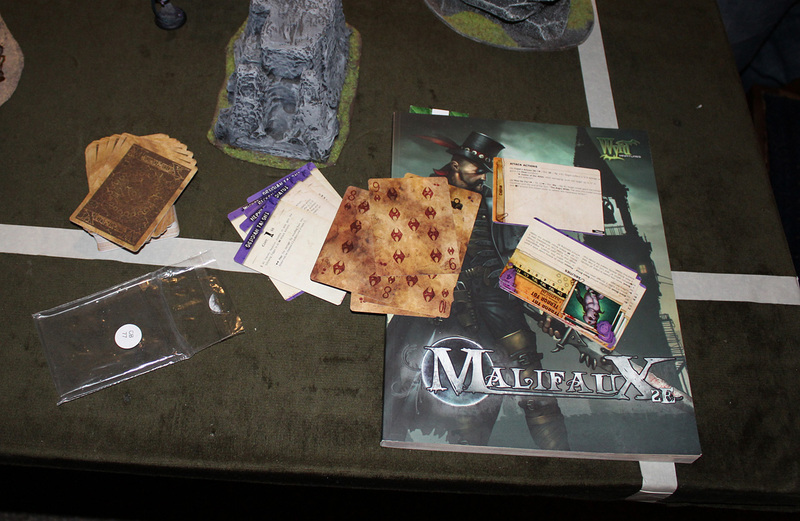 I heard many positive comments about Malifaux all across internet and from my close friends. 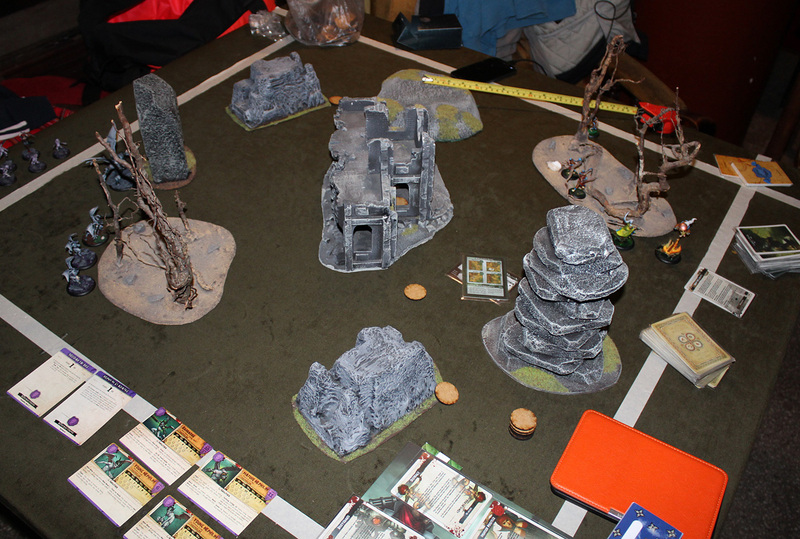 And right now I can confirm that – I love Malifaux and I will concentrate my gaming efforts on it in the near future. 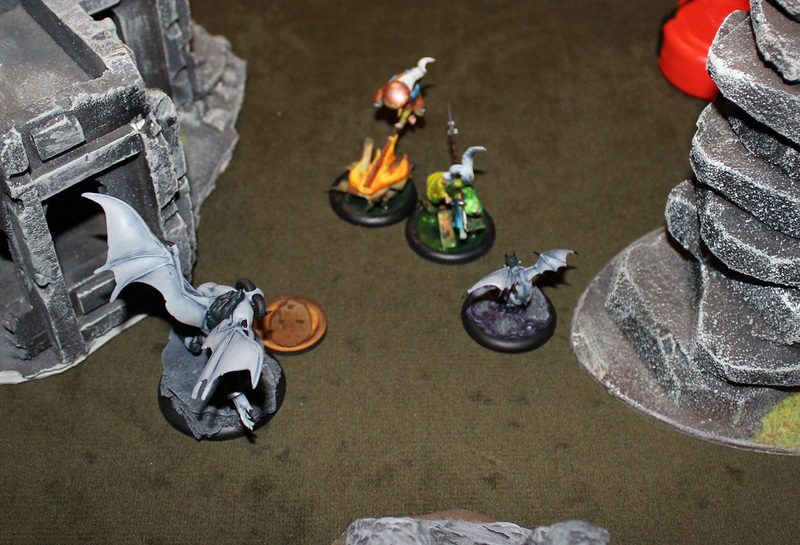 first of all, Malifaux like all skirmish game is fast. You need only 2 hours or so to play the full proper game. That’s the beauty of all skirmish! Handful of models, not so big table with few pieces of terrain and you can go ahead. In my first game I used only 4 models, and my opponent 5. We played around 1,5 hours and I needed the rules explanation constantly so the game was lengthen a little bit. the game is not about simple – elimination of all opponent’s models. The variety of ways how you can get victory points is enormous. 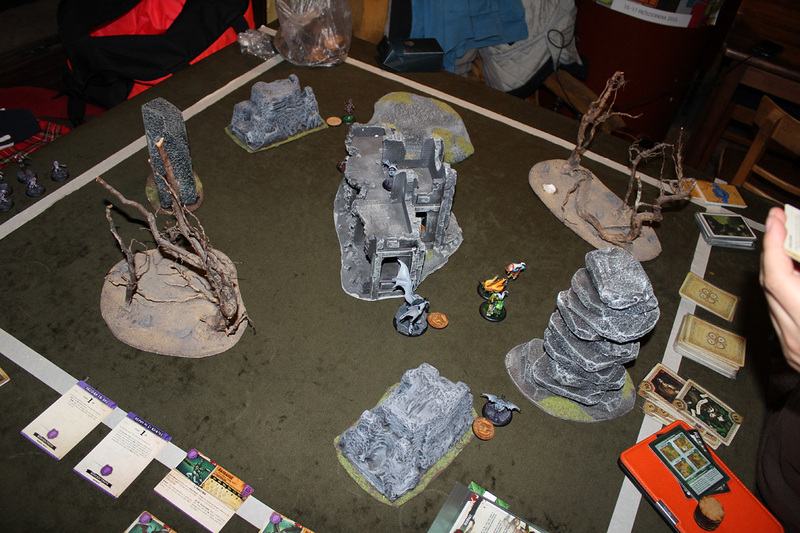 In fact, beside main strategy – both players could have different hidden agendas (called schemes in Malifaux) and ways how to earn victory points. 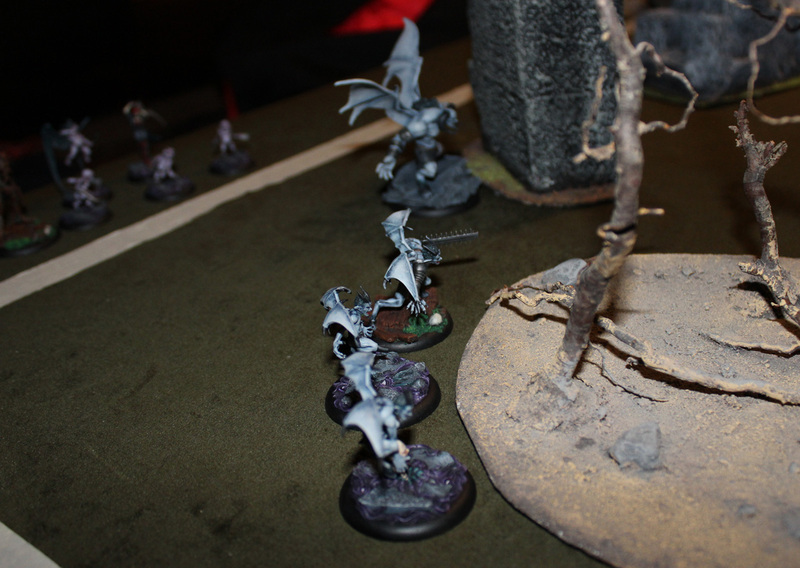 In my first game – I tried to kill enemy model – to get points from Murder Protege scheme and protect Mature Nephilim (points form Bodyguard scheme). Both schemes were hidden and opposite player couldn’t knew what exactly my strategy is… This is so cool. The gameplay become more complex and you’ll not get bored easily with Malifaux – the game is not that much repeatable and makes gamers stick to it for longer period of time. 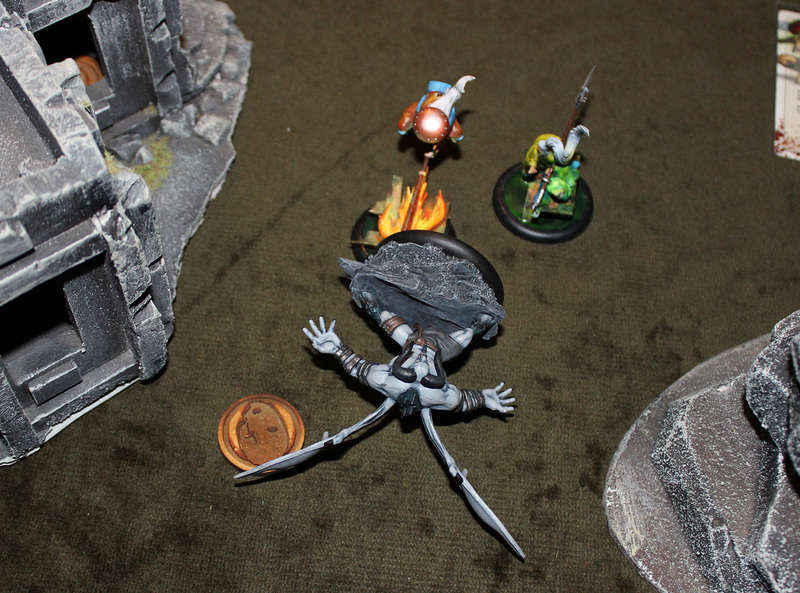 In Malifaux there are no dice. And no rolls obviously. Instead each of the player use deck of cards. Each card has the value and that value determines if you achieve or fail the task. In their hands players have 6 additional cards which can me put into game instead the one just flipped. It it called Cheating Fate. Well, in my opinion it seriously limits the randomness of the game (in our 25 Soulstones game – almost every time we could change the card if we flipped too low value. I can imagine in larger battles – 6 cards in the hand is not enough to Cheat Fate every time) which is great. It demands from the players tactical thinking and anticipation of opponent’s future moves. 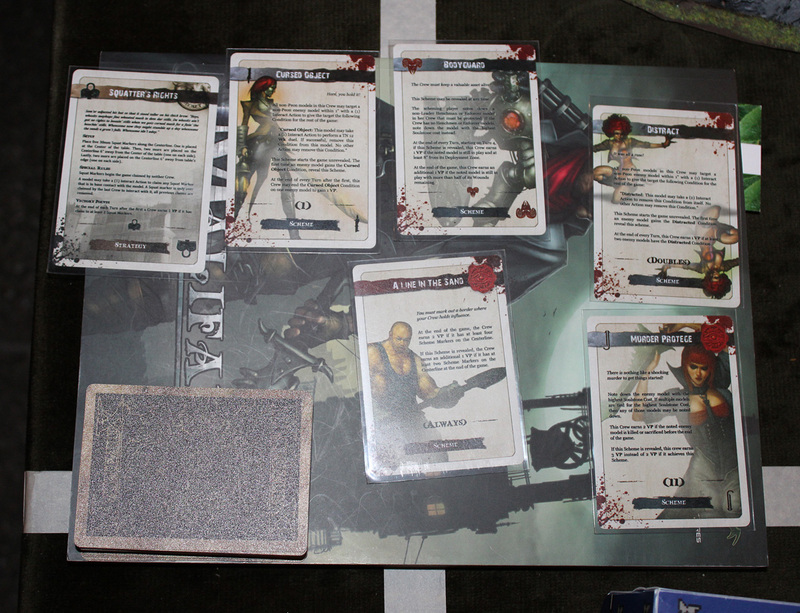 Rulebook and deck of cards…plus models and you can start the game:). Well, I’m very impressed how the game system works. I already dived into the rules and started to study other factions. Right now, admittedly, I will not have many opportunities to play while I’ll be travelling, but I have plans to paint Malifaux miniatures while I’ll be away (Pandora “No Shelter Here” box plus Doppleganger model are going with me:). I believe excitement will even grow when I start to play with Masters. Lilith just waits to feast on human blood! Hell, yeah! So, any Malifaux players out there? Australia, Indonesia, Singapore? I’d love to meet and play if possible:). Great post. I think your opponent picked a really good way to introduce you to the game taking a (relatively) un-killy crew and playing Distract; Malifaux is not only about killing stuff (though it can help a lot). In terms of your first minus point, I think that the belief that the game favours the player with more miniatures in their case (due to the way crews are constructed) is only true up to a certain point. You can get better results playing with pieces you know really well, even if they are not perfect for the strategy and schemes. Conversely, playing the ideal piece won’t help you in a game if you’re not familiar with their powers. Your second minus point is not really a negative for me; there are so many permutations that the game stays fresh even when you play a lot (like I do). The cheating fate mechanic is more noticable in larger games (50SS is most common in my country). Having only 6 cards to cheat in for a crew of 7 or 8 pieces really makes you choose when to use them. The other advantage of the card deck over dice is that there is only a certain amount of ‘bad luck’ in the deck. WIth dice, we’ve all had days where only 1s are rolled. With cards, once the four 1s are out of the deck, they’re not coming back until you have cycled the deck. This is not to say that luck is not a factor, but at least the impact is slightly limited. after my first game I must say Malifaux is great and I already spending my evenings on planning which way I should go with it. All models look super cool, and it’s really hard to decide which one to buy and paint next. Gosh! For sure I’m going deep into Malifaux:). Next PostGame of Travel vol. 2 – starts now!